Type of wine: Dark red with bold fruity flavors. Origin: The earliest knowledge of this varietal is that it originated in Greece. It is not known exactly how or when this plant was transported into Italy, but the history of this grape in Italy dates back many centuries. In the 17th century, it is known that the Benedictine monks named the varietal "Primitivo" because of its precociousness (early maturity of the grape) in this zone. Primitivo has been called many things, but is also known as the father of the Zinfandel grape, now so popular in California. In recent years, DNA studies at the University of California at Davis show that the Zinfandel grape is the same as the Primitivo grape grown in southeastern Italys Puglia region. Description: Deeply colored, rich, and concentrated with flavors of zesty cherry, clove, wild blackberry, raspberry and spice. Aging: Ready to drink now, "mature fruit" over next five years. This Is a fine wine to cellar (over 20 years), but it should be enjoyed young for its charming, vibrant fruitiness. 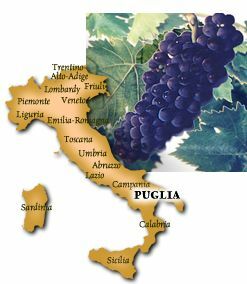 Best location: The climate in Puglia is always warm and sunny, so the wines that come from there are quite different in characteristics than the wines made farther north, in places such as Tuscany and Piedmonte. They are more "sun-kissed" in style and show this by having an abundance of juicy fruit flavors. FastFoodFacts: lamb, pork, grilled beef, ribs, roasted red meats, wild game, spicy cheeses and pizza.